The mausoleums of Tokugawa Clan (徳川家霊台) was built by the 3rd Tokugawa Shogun Iemitsu. There are two mausoleums, one for 1st Tokugawa Shogun, Ieyasu, and other is 2nd Tokugawa Shogun Hidetada. They are constructed in 1643. The buildings are common structures of Edo period. It is registered as the UNESCO World Heritage Site. Time: 8:30 to 17:00 (last entry is 16:30). 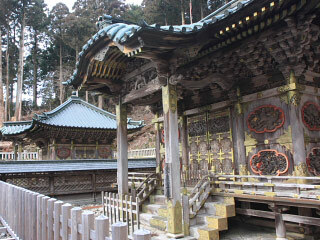 The mausoleums of Tokugawa Clan were constructed by Tokugawa Iemitsu. It was built in 1643. It was used to be Daitokuin Temple, but the temple was marged to other temple and moved, and only the mousoleums remained. The left one is Iemitsu's father, Hidetada. The right one is for his grand father, Ieyasu.